The St. Petersburg metro is more than 60 years old. The metro of St. Petersburg is the deepest in the world on an average depth of the occurrence of the stations. Today there are 5 functioning metro lines; their length is 112, 54 km. The number of stations — 63 (among them there are 7 transfer hubs), 11 of them are combined with depots or railway stations. 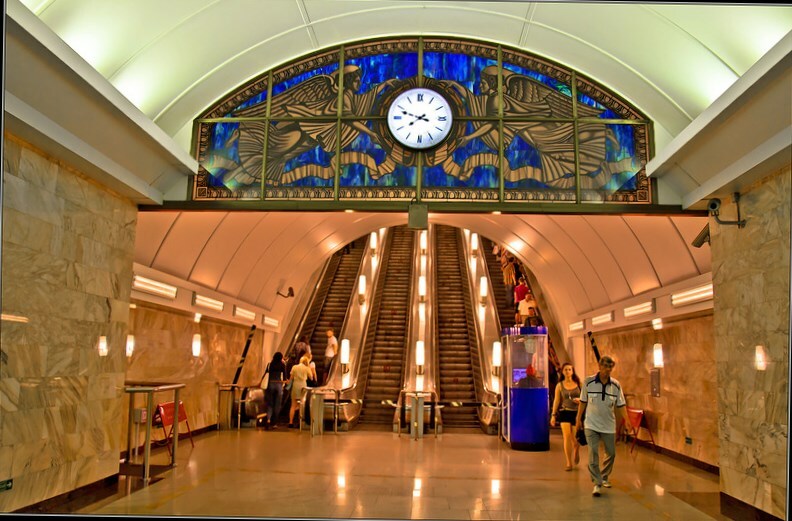 - The metro in the city could appear during the reign of the last Russian emperor. The possibility of its construction was discussed at the end of the 19th century. At this time the noisy argued about construction plans of the Metro Railroad, due to the fact that there was no even a tram in the capital these days. In 1901 the engineer Pechkovsky suggested to construct the country station near the Kazansky Avenue and to connect the expensive downtown with the Varshavsky Rail Terminal and Baltiysky Rail Terminal by the elevated subway. Other engineers offered singularly ready projects providing construction of six city lines with a total length of 102 kilometers. But in the 1903 the project was rejected by Nicholas II. As a result the first stations were opened in 1955. Other engineers offered singularly ready projects providing construction of six city lines with a total length of 102 kilometers. But in the 1903 the project was rejected by Nicholas II. As a result the first stations were opened in 1955. From 1995 to 2004 this section of the metro did not work. In a tunnel there was a scour caused by destructiveness of quicksand that almost for 10 years blocked the connection between two stations. The cut face began filling with water through the appearing splits. Emergency closing valves on account of the quicksand's sweep wasn't managed to close completely, but, according to official data, all people were saved. Tunnels were submerged on kilometer; the considerable part of ice-solid body was frozen-thawed. As a result of this accident at Ploshchad' Muzhestva and adjacent city mains were formed downwarpings, the sides of houses and above-ground structures creaked. - There is a ghost station in the St. Petersburg metro. In the St. Petersburg metro there is one forever closed station — "Dachnoye". It was the singular out-of-door ground station. In connection with its interim status and for costs reasons it was constructed as above-ground, fated for reception of the five-carriage trains being on-stream at that time on the Kirovsko-Vyborgskaya line. The station received its name according to extensively developing community in those years named Dachnoye. The entrance hall of the station rested on Tramvayny Avenue (aligned of east transit of Novatorov Boulevard). Hereafter it has been found that on account of external impact on buildings and constructions of metro exploitation of the opened ground-borne part was difficult. The station existed 11 years and was closed in 1977. The Devyatkino station is the first metro station in Russia built in the next to St. Petersburg subject — the Leningrad Region. Before start-up of the Myakinino station in the Moscow region the St. Petersburg metro was the only metro of such type in country. For the first time in the world they used the closed type stations in the St. Petersburg metro. There are 10 closed type stations in the St. Petersburg metro today, and the first of them is Park Pobedy. Today similar stations are not constructed anymore; however existing stations are a real "visiting card" of the St. Petersburg metro. By the way, the drivers working at lines with such stations get a rise to their salary. Vosstaniya, on the place of Saints Cosmas & Damian church — the Chernyshevskaya station is located today, and instead of the modern station "Sennaya Ploshchad" earlier there was the Dormition Cathedral. By the way, superstitious citizens closely connect the demolition of this church with tragic incident at the station in 1999. Several stations of the subway are located in the zone that is flood at floods. Therefore entrance halls of these stations are raised on several steps over the surrounding landscape. For example, at the level of 2, 5 m above a normal water level in a zone of flooding will appear the next stations: «Primorskaya», «Gor'kovskaya», «Krestovskij ostrov», «Chkalovskaya», «Sportivnaya», «Nevsky prospekt», «Admiraltejskaya». And in case water rises by three meters, then the «Chyornaya rechka», «Sadovaya», «Spasskaya» and «Vasileostrovskaya» stations will be damaged.